What will be new on the 2018 Chevy Traverse? Crossover are flooding the market right now. These vehicle draw in customers with the sheer amount of versatility they have to offer. One of the standouts in this class has been the Chevrolet Traverse. Traverse fans will be eager to know when they can expect a new version of their favorite crossover. The new model of the Traverse has just been revealed. So what will be new on the 2018 Chevy Traverse? A new engine will be offered on the 2018 Chevy Traverse. The crossover can be equipped with a new 3.6-liter V-6 engine. Performance numbers are not yet available on the new engine, but Chevy is anticipating a 10 percent increase in horsepower and fuel economy estimates checking in at around 25 miles per gallon highway. The new RS trim will be equipped with a 2.0-liter four-cylinder engine. Both engines will come equipped with a stop/start feature that helps improve fuel economy. Read More: Take a look at our selection of Chevy vehicles! Two new trim levels will be added to the Traverse lineup for the 2018 model year: RS and High Country. The RS trim is designed to added sporty performance to the crossover, while the High Country places an emphasis on luxury. RS models come equipped with 20-inch wheels, the four-cylinder engine and special black exterior accents. 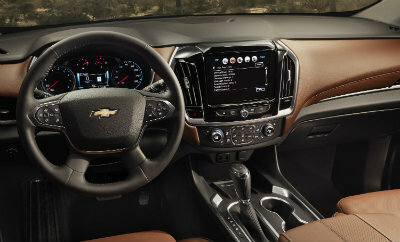 High Country trim levels will come equipped with unique interior trim, Loft Brown leather appointments, 20-inch polished wheels, power-fold third row seats and the special twin-clutch all-wheel drive system. When the 2018 Traverse arrives, be sure to stop by Wolf Auto for a test drive. While you wait, take a look at our selection to learn more about everything we have to offer. This entry was posted on Monday, January 23rd, 2017 at 7:20 pm	and is filed under Chevy, Chevy Traverse, New Models. You can follow any responses to this entry through the RSS 2.0 feed. You can leave a response, or trackback from your own site.